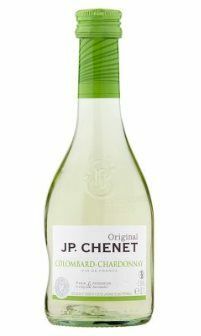 This JP Chenet Colombard Chardonnay comes from the Côtes de Gascogne vineyard in southwest France (Gers). The main characteristic of the vineyard is its hilly lanscape and ocean climate, producing fine and aromatic white wines from Colombard and Chardonnay varieties. This wine has a very light yellow aspect with green reflections and a delicate nose characterised by floral (white flowers), fruity (pear, lime...) aromas and a crisp finish. Very well-balanced. Ideal with salads, chicken and fishes. Also, great just for sipping !